With the advancements in today's technology, it may seem as if your car and trailer can use the same tires. However, there are obvious differences, which mean your trailer has different tire needs than the car or truck you use to tow it. Continue reading to learn the differences between the tires on cars, SUVs, and trucks vs. trailer tires. Whether you are towing your trailer with a truck, SUV, or car, the vehicle doing the towing is the leader. As a result, the tire design and traction of these tires is designed to promote acceleration down the road, cornering, and stopping. In addition, the tires on your vehicle are designed with optimum comfort in mind. This is mainly achieved with special sidewalls that flex and bend. On the other hand, your trailer is a follower. As a result, a flexing tire wall is a major negative. If your trailer has flexing sidewalls, your trailer will sway, especially if the trailer has a heavy center of gravity. The strong and stiffer the sidewalls of the trailer tire, the less likely the trailer will sway. Simply put, this increased tire stiffness is designed to support the weight of the trailer without flexing. While the tires on your car, truck, or SUV are designed to provide functionality for several maneuvers, the tires on a trailer have much simpler responsibilities. The tires on the trailer are engineered to simply support the weight of the trailer for thousands of miles without bouncing the trailer off the road. Trailer tires are also much more durable than tires on cars because of the thickness of the sidewalls and the rubber compound used in these tires. The tough and hard rubber compound of trailer tires helps reduce rolling resistance. However, tires on your car have a softer rubber compound, which is needed to help the car grip the road, add comfort to the ride, and perform maneuvers. Typically, most car tires are designed radially, which means the interior belts are set at 90 degree angles so they are always pointed toward the traveling direction. Radial tires offer a better ride, better traction, and fuel economy. On the other hand, the best trailer tires are bias-play types, which use belts at 45-degree angles. These types of tires are more damage resistant, rugged, and specifically designed for trailers. If you are buying a new or used car, truck, or SUV for towing, consult the knowledgeable and friendly folks at the Olympia Auto Mall serving Puyallup, WA. They will make sure you have the right equipment for a successful tow. I have a Chevy Silverado 2500HD towing with a trailer. I use my trailer specially while i am going for a campaign or travel for a long time. 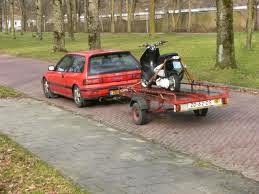 You are nicely briefed the difference between Car Trailers and car tires. Thanks for sharing! Nice Posting done by you. i always find you your blog interesting.keep on posting such nice things..